I have been getting so much response to this post about Carrie’s visit to WXBQ Radio, that I wanted to leave it up another day. I did want to add this photo of Carrie from American Idol’s season four. She was pretty then, but she’s just gorgeous now. I also need to thank Reggie Neel for allowing me to use the photos below, that were taken at the radio station on Friday. I’ll be seeing Reggie later this afternoon, and I’m anxious to hear more about his visit with Carrie. Carrie Underwood stopped by WXBQ Radio in Bristol, VA, before her performance at East Tennessee State University on March 28. 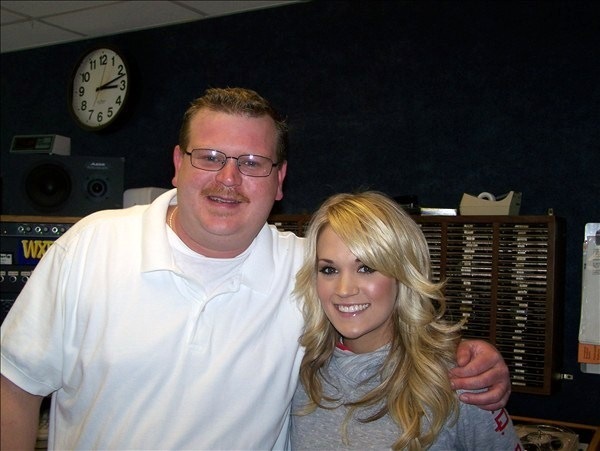 Pictured here with Reggie Neel, Carrie was kind enough to give a little on-air interview for Reggie’s listeners. And, does it surprise anyone that Marc Tragler took a minute to give Carrie a little hug? (*smiling* at ya, Trags.) I didn’t think it would. Marc takes the air at 3 p.m., right after Reggie is done. Our country entertainers often drop by the WXBQ studio when they are performing in the area, or just passing through this area. Carrie has left Johnson City, TN, and is now headed to Saginaw, Mich., where she will perform at the Dow Events Center on March 30; then it’s off to Grand Rapids, Mich., for a March 31 concert at the Van Andel Arena. April 1 will find her in Green Bay, Wish., followed by an April 3 show in E. Lansing, Mich.; an April 4 show in Columbus, Ohio; and an April 10 performance at John Paul Jones Arena in Charlottesville. With a schedule like that, we can only appreciate all the more the fact that she took a little time out for the folks at WXBQ – and WXBQ’s listeners. Talk to you guys later! Hope your Saturday was a great one! Carrie is absolutely the best, ever, ever ever!!!! She is so humble to her small town roots, and Checotah now is a “double stop light town” as she mentioned at the concert!